I have to admit - I'm not always one to have a witty comment to say to the characters. I'm the type of person that has a great comeback after I've already said something. And honestly, I rarely have much to say when I meet characters - we're goading the boys to say hi, smile, etc... but, not actually interacting with them ourselves. But, if you were following on facebook, twitter, or instagramhttp://instagram.com/disneybabiesjenn over the weekend, you might have noticed that my husband spent a few hours in the Magic Kingdom all by himself. 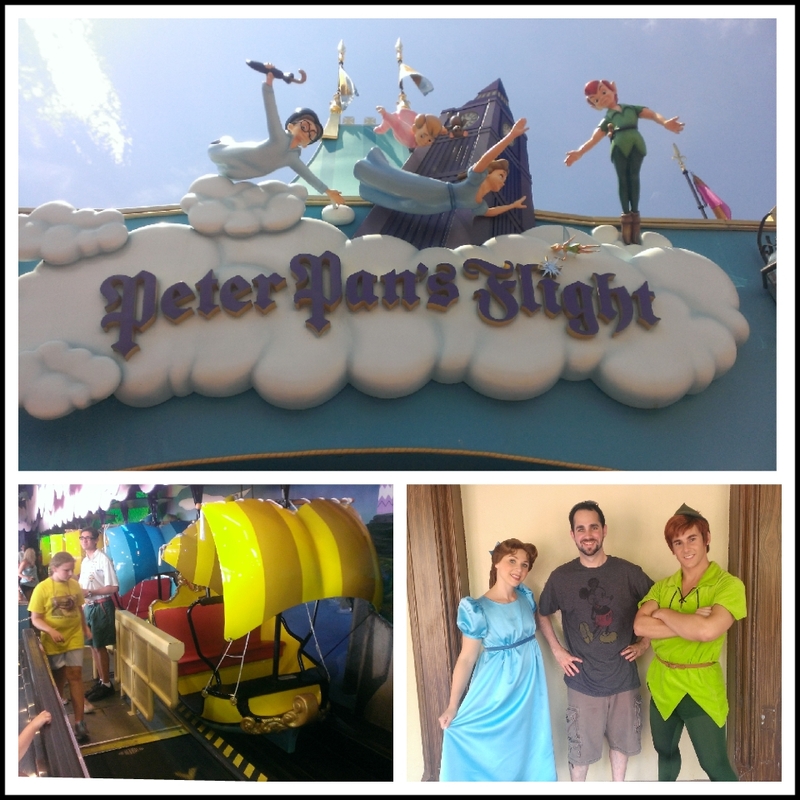 In my honor, he met a couple of my absolute favorites: Peter Pan and Wendy Darling! Peter Pan's Flight is my favorite dark ride. Yes, it's short, but I adore it! And, even though Peter can be a bit.... bratty... I still have a soft side for the characters! Peter Pan is also known for some of the best reactions to comments. Adam: "Does anyone smell something?" Peter: "What do you smell?" Peter ran away after that. Adam - to Wendy - "It's okay! I heard a tick-tock"
Wendy - to Peter - "Peter, come back! The croc is on the way!" Peter came back with that! Now, for those of you who don't know my husband (i.e. 99.9% of readers), he is very quiet and usually laughs at me when I make conversation with random people, so this was not his norm, but I LOVE that he did it! Next time you're meeting a character, think for a minute to give them something great to say! I like to compliment the female characters on their outfits, especially if they are dressed for some occasion, like Halloween or Christmas. I like to say "Give me four" to the fully covered costumed characters! I know that Peter is usually pretty, um, interactive to visit with! Mary Poppins is another fun character to chat with. Mulan at the China Pavilion was terrific. And if you get a chance to meet Lady Tremaine, with Anastasia and Drizella, try to have a single guy in your group to marry off to one of the step-sisters! Cinderella can be quite sweet, I had never in my life seen my 24 year old nephew blush - he went beet red and could barely talk when he met Cinderella! You're good!! I need to get better. Love the "give me four"
I used to be totally awkward with character interaction, freeze right up and have no words. I think it was after going to Crystal Palace a couple of times I loosened up. I remember going completely blank the first time I met Cinderella - she was so beautiful and her gown . . . Froze up like I was on a first date with a movie star. Somewhere I have a photo of it. hahahahaha!!! That's so funny!! I need to think of something clever to say to them next time. My kids and I talk in line before meeting a character about what to ask them. It's amazing how quickly kids stop talking when they meet a character! If we think up something to ask or say, they feel more comfortable. When we met Peter Pan and Wendy on our last trip, my oldest asked him if he would crow. It was lots of fun! And yes, he did crow for us.